I finished my Prairie Schooler piece! Woohoo, yay me! I even messed a little bit with a classic. Can you tell what change I made on the design? The top corner was actually supposed to be a pumpkin in a bowl type thing. But I didn't really like it, and for a Thanksgiving piece I thought the tiny turkey in the lower right wasn't enough. So I checked and the turkey on the little 4-square design in this chart fit perfectly into the upper right box. I am happy with my decision to stitch it my way. 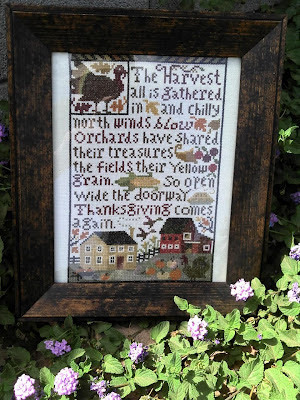 I am not sold on the frame yet, it is a little too small, and while it doesn't cover any of the design it also leaves no room for a border around the stitching. I was so excited to find the frame though, guess where? Goodwill of course. The best part was it still was in the original packaging with the original sale tag from Aaron Brothers Framing listing the price as $18.99, and I got it for $3 bucks! I was a little tempted to take it back to Aaron Brothers to see if I could just return it and earn $15 dollars. But it was the exact color frame with the bits of gold and brown that I wanted for this piece. I am hoping it will grow on me. 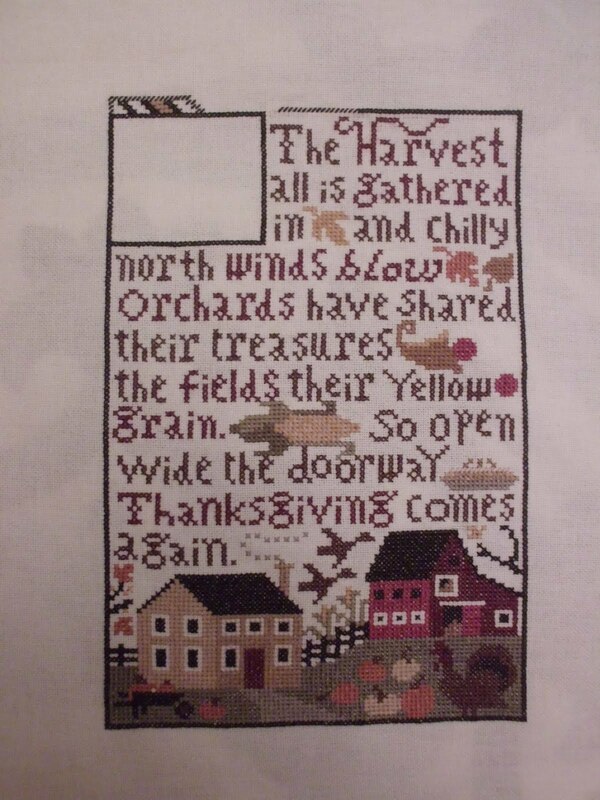 This is what I have been working on lately, Prairie Schooler "Thanksgiving comes again". 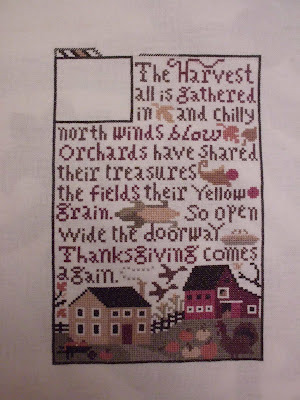 At this rate it should be done in time for Thanksgiving! It has been fun, but the last week I have hit a stitchy slump on it. 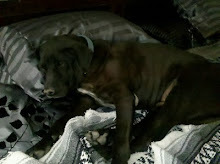 This is how we spent our last day of summer time. Relaxing in a creek. 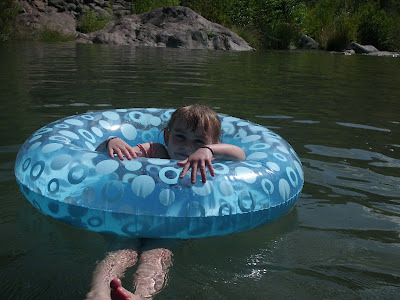 It was so much fun, we spent all afternoon swimming/floating/playing. This is my youngest in her little inner-tube. 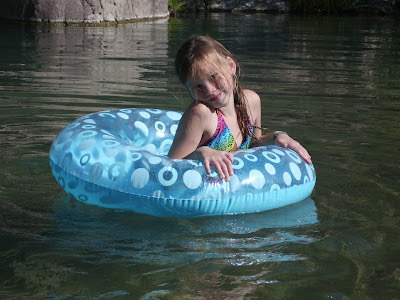 She is actually a better swimmer than I am, she swims underwater like a fish! And this is my oldest swinging from the rope swing. 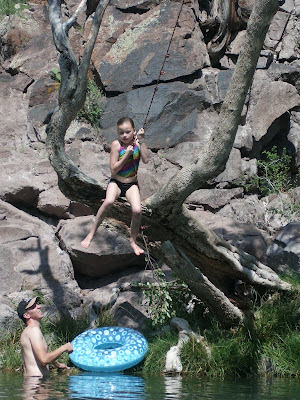 You may remember pictures of me last year doing this, and let me tell you that tree is way higher once you are up there clinging to that rope. For me it was terrifying (i'm a little scared of heights), but my oldest loved it. Again my oldest swimming in the water. There are huge schools of fish in the water that don't even seem to notice you. And this is the first day of school. 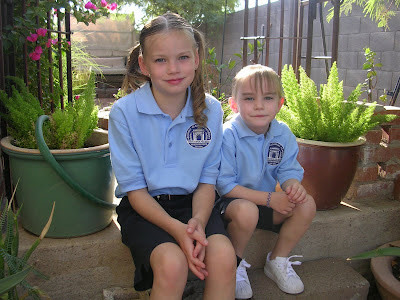 My youngest started kindergarten this year,sniff sniff my baby is growing up. They had their new school uniforms all pressed and ready to go. I mentioned in my last post I had trouble finding shoes for her, so I had to order them off Amazon. When the box came I thought it would be neat to let her open her own mail. So I gave it to her and she fought off big sister while ripping it open. Let me tell you, I have never seen/heard a more disappointed five year old when she got that box open to find plain white shoes. Poor kid.